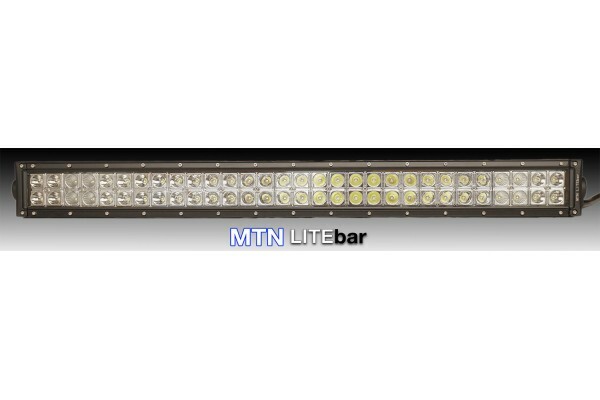 At over 1,000 lumens-per-inch, this bar puts out a virtual wall of light. 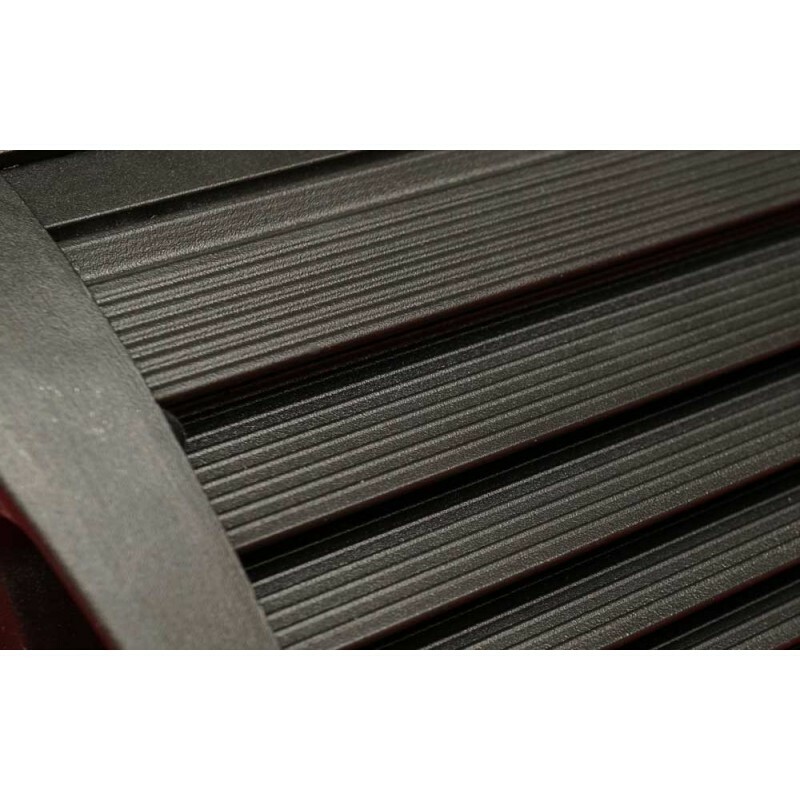 This size is popular for grill mounting on many full size trucks. 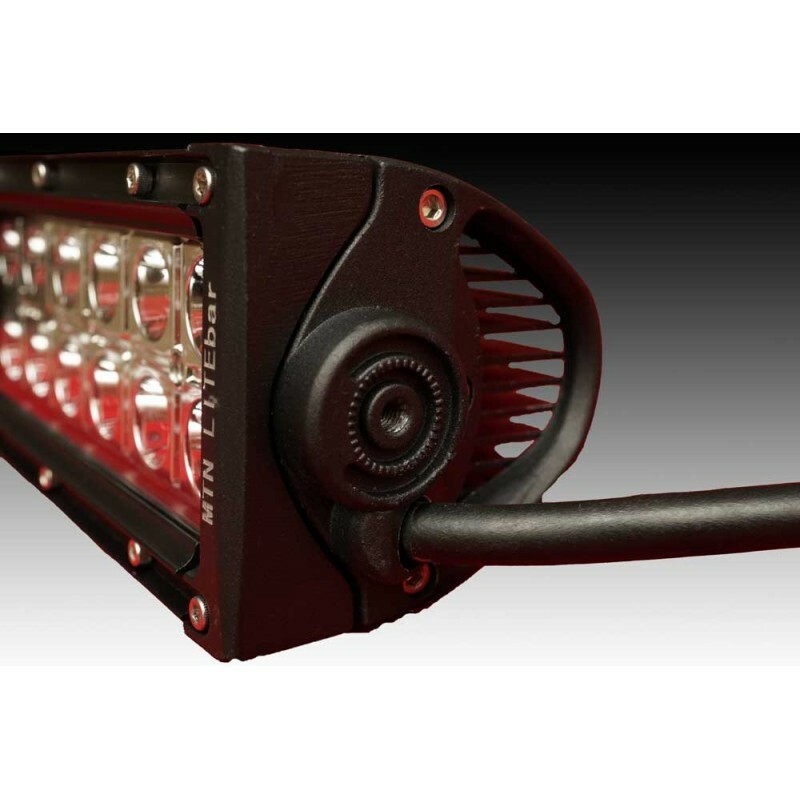 This light has twice the output of the Rigid 30" RDS light (70+ CRI version; 80+ CRI version is almost twice as much intensity, but is twice as many lumens and has better light quality. 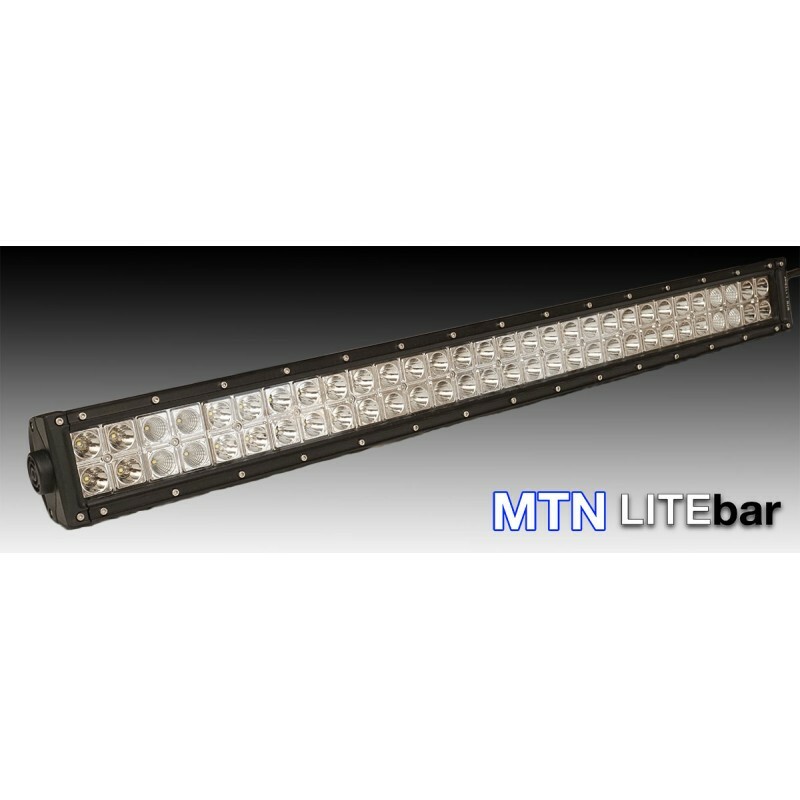 MTN LITEbar 30" - 70+ CRI Rigid RDS 30"
Available with 1, 2, or 3 normal modes. 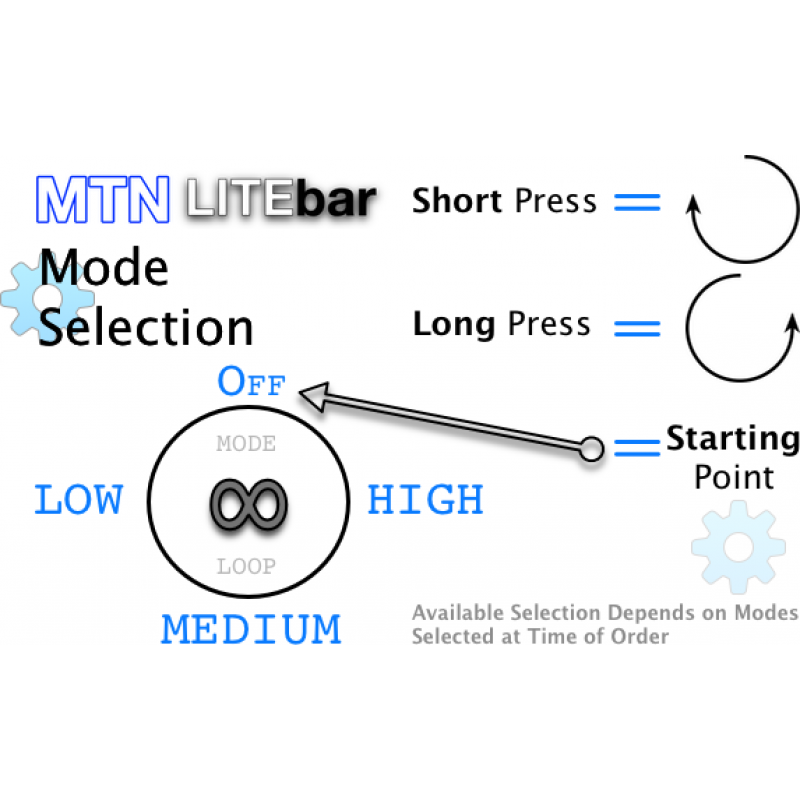 To select number of modes, simply hold switch for approximately four seconds to enter programming mode. To access "indicator" mode, hold switch for approximately two seconds. 36,300 LED lumens (70+ CRI); 33,000 LED lumens (80+ CRI). 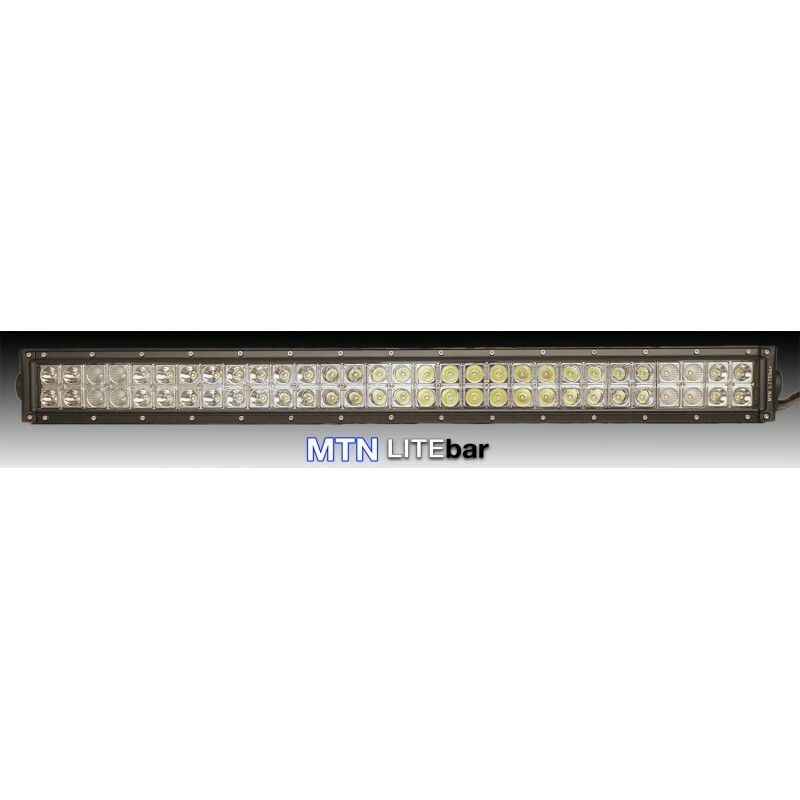 Mounting hole spacing (center-to-center): 33.75"
The MTN LITEbar kit includes all of the parts you need to run the LITEbar, except for custom mounting solutions. Ext. 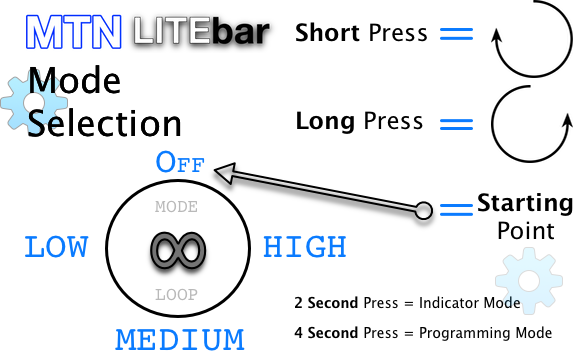 Cord Length: This is the cord that connects between the converter and LITEbar. There is already ~18" worth of cable on the LITEbar & converter; subtract that amount from the cable length you order. If your distance will be 18" or less, then you don't need an extension cord. 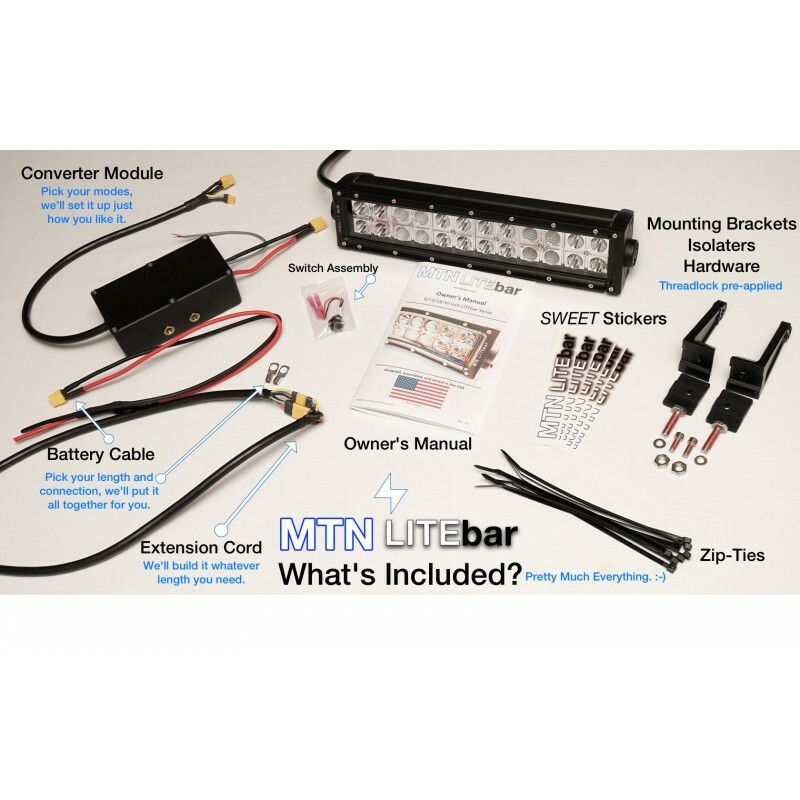 Battery Connection Type: We'll help you get connected to your battery with a variety of different connection options. Batt. Cable Length: This is the cable that connects between your battery and the converter. LED Type: All of the LEDs we use produce excellent light, but you can choose between slightly richer color rendition (80+) or slightly higher output (70+). Both are excellent choices! What is involved in installation? What tools do I need? 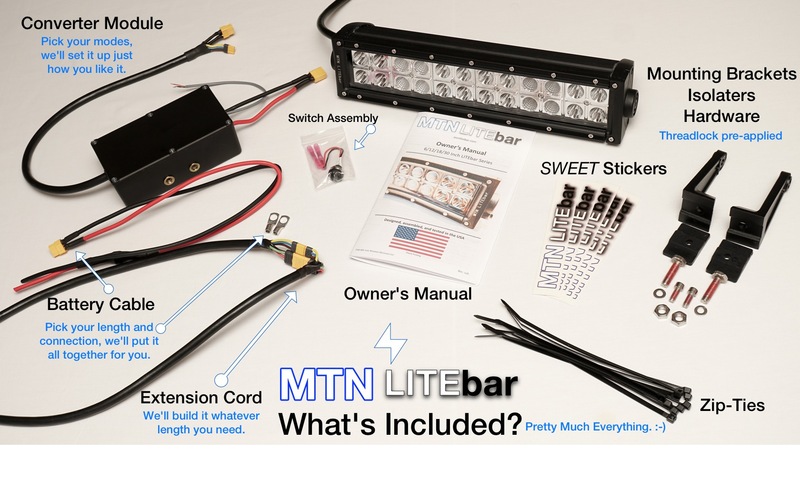 Beyond custom brackets, pretty much everything else you need to install the LITEbar is included. You need some common tools, like wrenches and a drill. Please see the Owner's Manual PDF for more information. How do I know what length extension cable to order? Measure the length of the wire/string, then subtract 18". 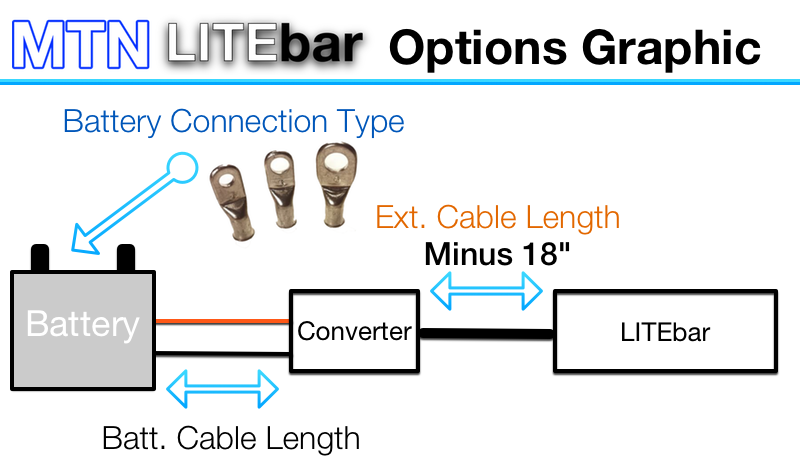 Most converter & LITEbar assemblies have ~18"-24" of combined cable already installed, so if your run is 18" or less you will not need an extension cable. Select the appropriate cable length (length of run minus 18"). What if I order the wrong length cables? See the 14-Day Cable Exchange Plan, below. 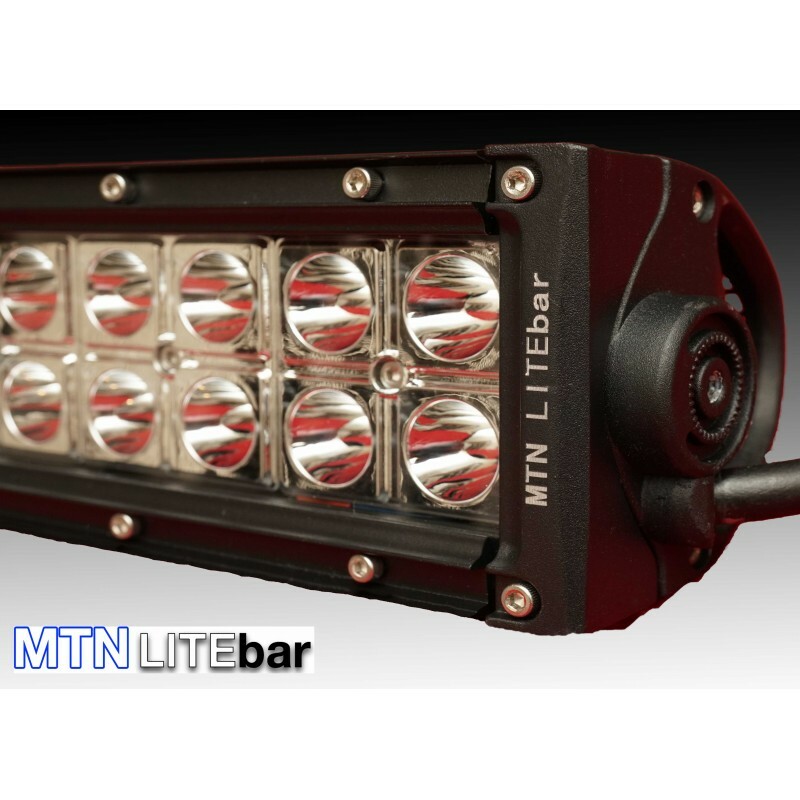 Each MTN LITEbar 30" Series + Converter is covered by a Limited Warranty. 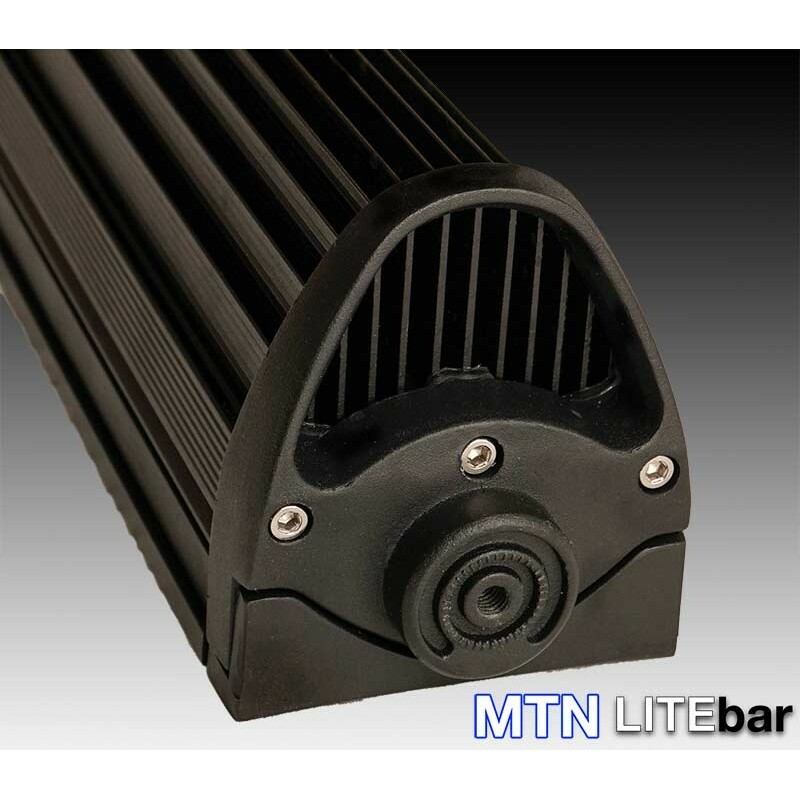 This warranty covers all defects in manufacture and workmanship for a period of 1 year from the date of purchase, during which time the manufacturer will cover all labor, parts, and shipping costs related to the repair or replacement of the LITEbar assembly. After the initial 1 year period has passed, for an additional period of 4 years (5 years after the date of purchase), the manufacturer will cover the cost of parts only, with the costs of shipping and labor not being covered under the Limited Warranty. The Limited Warranty does not cover any accidental damage caused by excessive heat, vibration, sun damage, collision, road debris, etc. This Limited Warranty does not cover any damage caused by incorrect installation. Additionally, this warranty does not cover paint fading or glass yellowing or other glass damage. 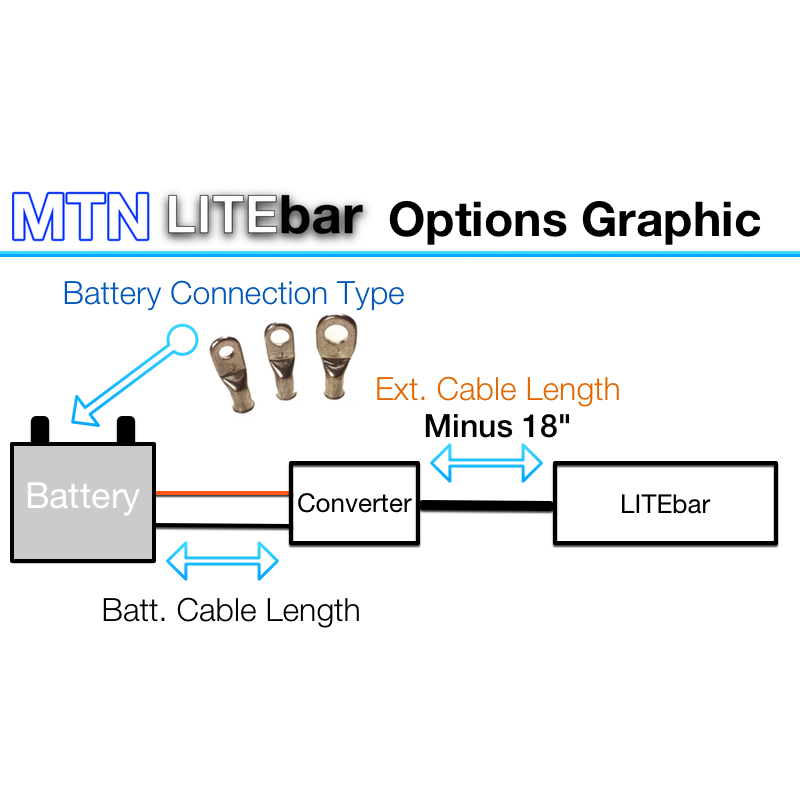 Order an MTN LITEbar system and get the wrong length extension cord or battery cable? No problem! Contact us within 14 days of the receipt of your kit and we will exchange your incorrect cord for one of the correct length (plus a small fee if the replacement is significantly longer). To schedule an exchange, please contact us. If it has been longer than 14 days after receipt, then you will have to purchase a new cord here.